The famous jewellery and luxury manufacturer Jacob & Co celebrates its 30th year in the luxury business with amazing novelties to be officially launched at Baselworld 2016. One of the Baselworld 2016 novelties is the Jacob & Co Astronomia Sky Celestial Panorama Gravitational Triple Axis Tourbillon. 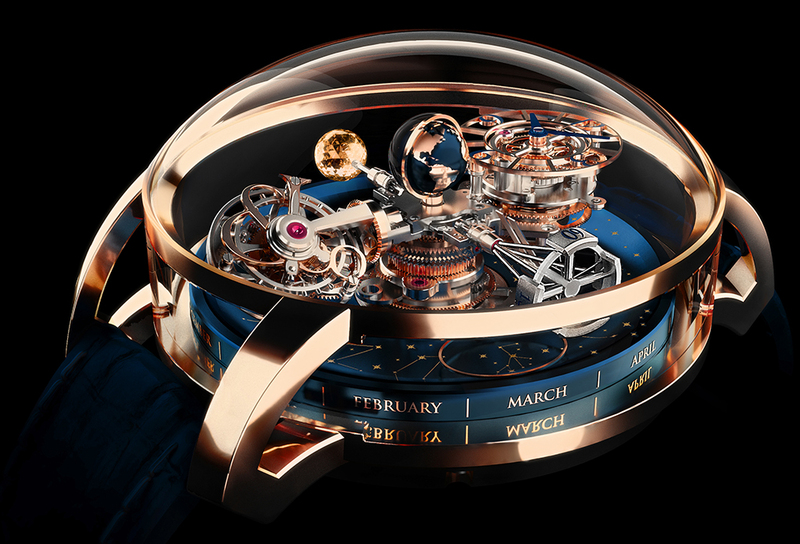 We have not seen the watch yet in person as the debut is planned to be at Baselworld 2016 but even the computer generated graphics of the watch was enough for us to be amazed. The Astronomia Gravitational Triple Axis Tourbillon which was presented in 2014 was already an extremely complicated timepiece. The new version Astronomia Sky is even more complicated with a sidereal 3 dimensional display accompanied with an elliptical sky indicator with 24 hour day and night display. The second novelty to be launched by The Jacob & Co this year is another extremely complicated timepiece. In order to celebrate its 30th year, the brand is preparing to launch a Grande Complication with a sporty character. 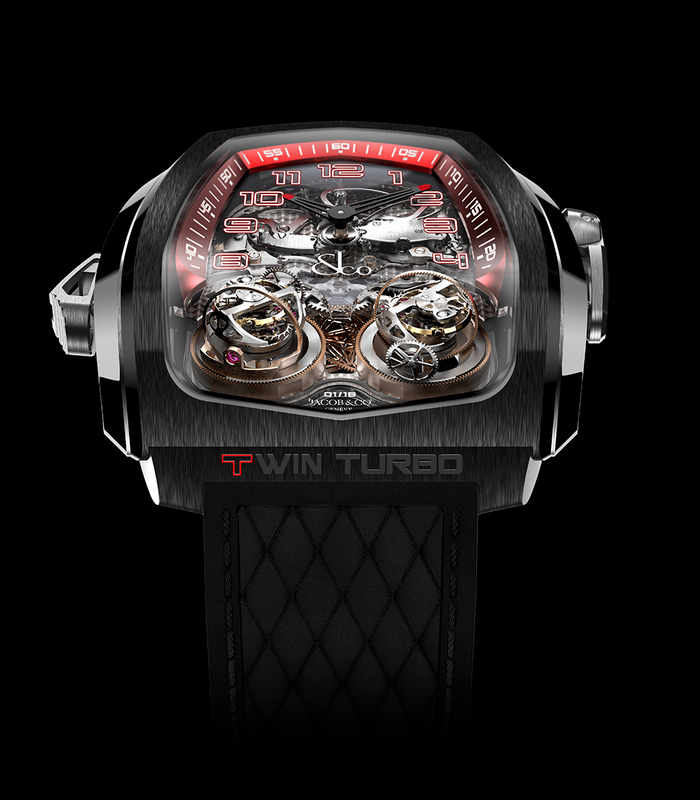 This extremely unique timepiece features twin triple axis tourbillions instead of a single one which will surely be visual feast to watch the movement ticks. 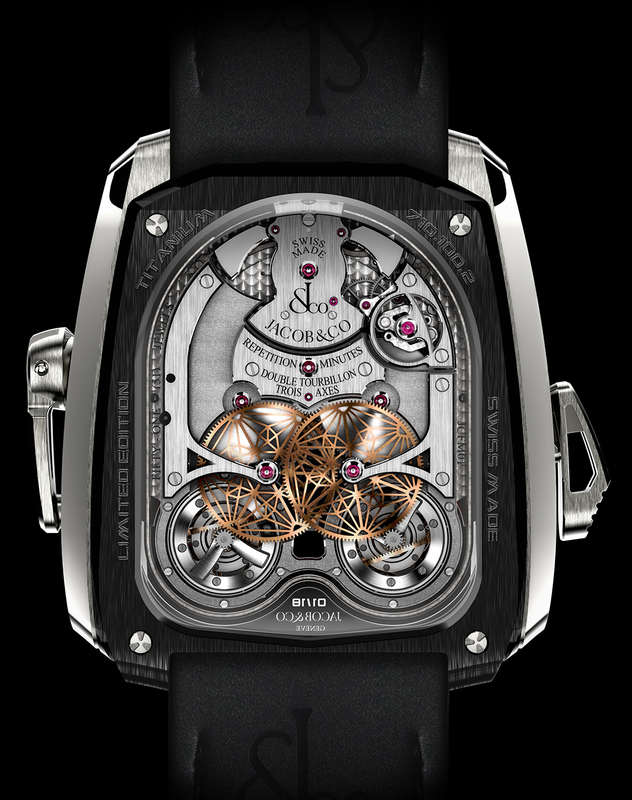 Besides putting a pair of triple axis tourbillions to the same movement, Jacob & Co managed to add a Minute Repeater module as well. The repeater module sports a gong system. It is also a digital repeater which means that it strikes the hour, the 10 minutes (different than the traditional 15 minutes) and the minutes. The back view of the Twin Turbo reveals a stylized design of triangle shaped parts in metal sporting an industrial look. As the name speaks for itself, the timepiece is heavily inspired by the automotive design. 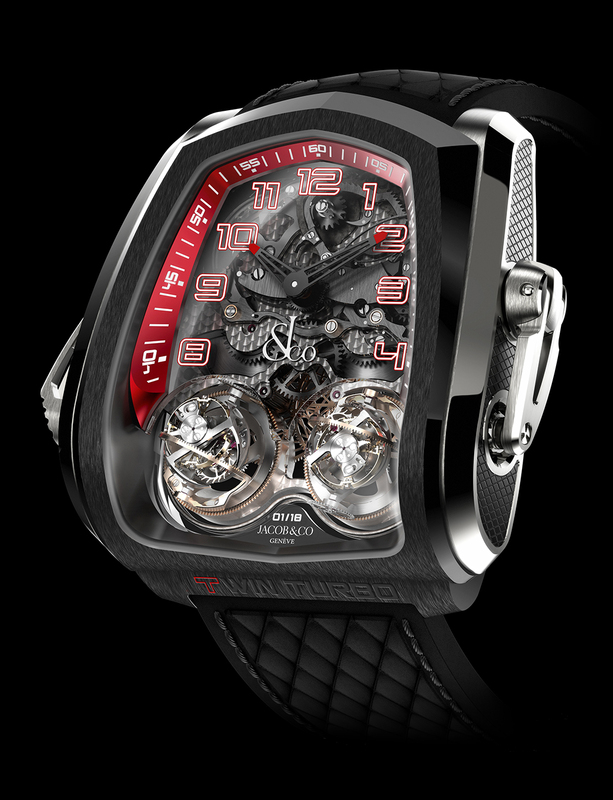 The titanium and carbon combined case boosts the sporty character of the watch and tributes to the automotive spirit. Both timepieces will be officially presented at Baselworld 2016 so please stay tune exclusive coverage and photos from the Jacob & Co booth soon..!